Indian Space Research Organisation (Isro) on Thursday successfully conducted an experimental test-flight of GSLV MK III carrying a crew module, to be used in future manned space missions. GSLV MK III carrying the crew module lifted off from the second launch pad of the Satish Dhawan Space Centre at Sriharikota at 9am. The GSLV's integral cryogenic engine phase was in a passive state and the suborbital test-flight was conducted mainly to test the flight validation of the launch vehicle and its new telemetric systems, apart from the atmospheric reentry pattern and thermal resistance of the module during the Crew Module Atmosphereic Re-entry Experiment (CARE). The rocket soared from the launch pad after a 24-hour countdown that commenced on Wednesday morning. The crew module separated from the rocket at an altitude of 126 km and then re-entered into the earth's atmosphere at 80 km. It then followed an uncontrolled trajectory into the Bay of Bengal about 180 km off the Andaman Nicobar Islands. The crew module weighing 3.73 tonne separated from the rocket about 325 seconds (five minutes) after the lift-off from the launch pad. The flight also tested the parachute deployment system of the crew module which has to work in a cluster formation to slow down the module and reduce atmospheric friction and thermal corrosion during its free fall back to the surface. 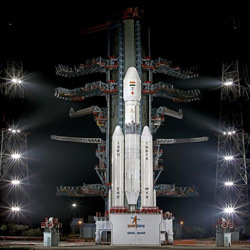 The GSLV Mark III is being projected as Isro's most advanced launch vehicle capable of injecting heavier satellites like GSAT 19e. The 630.5 tonne rocket has two active solid and liquid propulsion stages, S 200 and L110 respectively in addition to its cryogenic engine C 25 X which in in a passive state. The Coast Guard has been alerted to track and retrieve the crew module which fell into the Bay of Bengal near the Andaman & Nicobar chain of islands.